I experienced something a week ago Saturday that I've never experienced in person before. I attended the funeral services for a fallen serviceman. He was the 1,000th claimed by Operation Enduring Freedom in Afghanistan. I've watched services on TV before and seen photos and reenactments, but never been in attendance myself. We were just five of hundreds entering the church - a modern building with high ceilings and concrete floors. I've been in this particular church several times before and the noise generated by folks in the building is amplified and rather distracting. As we entered this day you could barely hear shoes touch the floor. Not a whisper, sniff or shuffle. None of the babies there even made the slightest sound. It was beautifully reverent and respectful. Photo I took from the balcony before I noticed the "no photo's note ate the end of the program. Even inside it was silent as those in the packed sanctuary just stood quietly facing the flag draped casket of Marine Corporal Jacob Leicht. 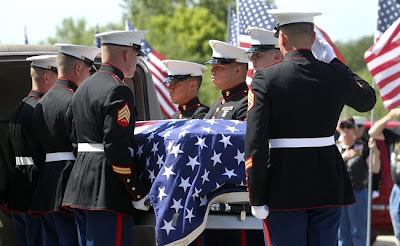 My children sat with rapt attention as each of four Marines, an older and a younger brother and a pastor from Cpl Leicht's early years spoke about what a determined, motivated, and Christian man he was, always thinking of others, always doing his best and always faithful. Tears slipped silently down our cheeks as we all sang the Naval Hymn and then listened to a cello mournfully play the Marine Hymn. I doubt there was a dry eye in the room as a slideshow of Cpl Leicht's life in pictures ended and two bagpipers playing Amazing Grace descended the stairs from the balcony and stopped at the foot of his casket. 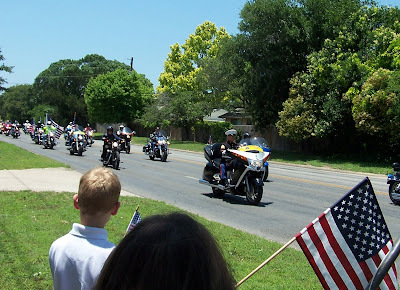 We were then honored to stand with members of our church family as the funeral procession drove past. Many had stayed after services that day and waited near the road with American flags in hand to offer their respect and gratitude to this fallen hero and his family from our community. It seemed like every police and sheriff car in the county was there as well as fire trucks from our town and nearby towns and nearly 100 rumbling Patriot Guard cyclists. The procession lasted for 20 minutes. The view from in front of our church of the beginning of the 20 minute procession. There were at least 100 riding with the Patriot Guard. There's no such thing as an ex-Marine. 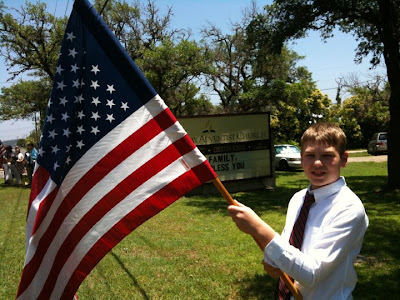 My son, Zachary, with our flag from home. We did not personally know Cpl Leicht, his widow, Leslie, or his parents and five siblings, but we had heard of him before. We had been praying with this fellow homeschooling family for his recovery from severe leg and face injuries he received on his first overseas tour in 2007. The Humvee he was driving had gone over two 500 pound IED's buried in that road in Iraq. Thankfully, only one of the bombs exploded and none of the men aboard were killed that day. Eighteen surgeries and two years later he received his wish to return to the front of battle with his Marine brothers - this time in Afghanistan. I can say that if this had been my husband or son I would have begged, pleaded and cried for him to take his Purple Heart and the well deserved medical discharge with disability benefits for the rest of his life and live out my "American dream". But that's not what this true American Hero did. or goaded by necessity, but in simple obedience to duty." I believe this is a description of Corporal Leicht. This young man, that would have been 25 on his birthday on July 4th, had his whole life ahead of him. But instead he begged and pleaded to return to battle - a battle against an enemy on foreign soil that seeks to harm innocents he didn't even know. I'm a mother of three married nearly 20 years to my sweetheart and I would willingly take the place of any of these treasures of my heart if giving my life would save theirs. But one of you few blog readers or another American stranger I've never met? I just don't know. Not to mention fighting and quite possibly giving my life to liberate a people and country in which I don't hold citizenship. It's a sacrifice that I believe few really understand. I'm glad we decided to attend this Memorial Service. It was one of those life moments that forever changes the way you think about something. 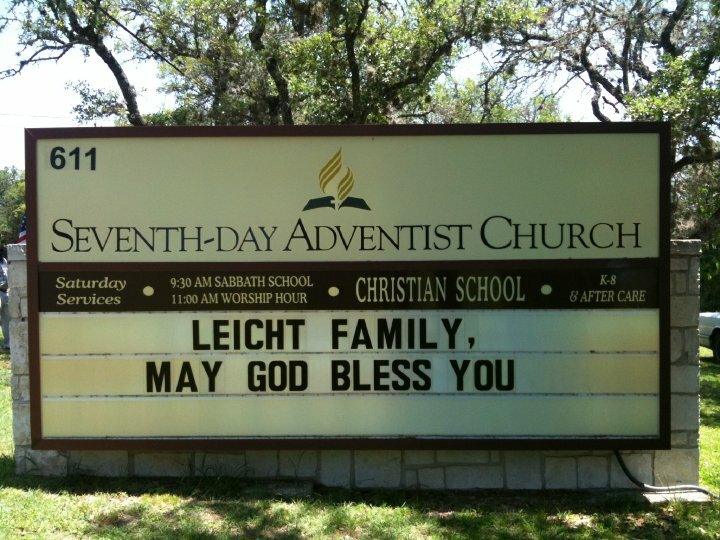 Cpl Leicht's passing received a lot of attention nationally, probably because he was the 1,000th service-person lost – but as of this post, 18 more mothers, wives, girlfriends, have gotten the news that her hero won't be coming home the way she'd prayed, having given his last full measure of devotion. Rest in Peace, young solider. Your work is done. We thank you. Semper Fi. But I would not have you to be ignorant, brethren, concerning those who are asleep, that ye sorrow not, even as others who have no hope. For if we believe that Jesus died and rose again, even so will God bring with Him those also who sleep in Jesus. For this we say unto you by the Word of the Lord: that we who are alive and remain unto the coming of the Lord, shall not precede those who are asleep. For the Lord Himself shall descend from Heaven with a shout, with the voice of the archangel and with the trumpet of God; and the dead in Christ shall rise first; then we who are alive and remain shall be caught up together with them in the clouds to meet the Lord in the air. And so shall we ever be with the Lord. Therefore comfort one another with these words. I Thessalonians 4:13-18. Beautiful and touching post, Sara.